Chlorite group is a group of mostly monoclinic (also triclinic or orthorhombic) micaceous phyllosilicate minerals with a structure consisting of T-O-T layers with two layers having their silicate tetrahedral apices pointing towards each other, separated by an interlayer that may be simple octahedrally coordinated cations or which may be a brucite. The chlorite group of minerals derives its name from the common green color of most varieties, although specimens of many diverse colors are known to exist. The morphology ranges from fine-grained earthy masses to spherules and rosettes to scaly flakes and pseudohexagonal platelets. Chlorite is a common accessory mineral in low- to medium-grade regional metamorphic rocks, and may be the most abundant mineral in metamorphic rocks of the chlorite zone. It is an occasional constituent of igneous rocks, in most cases probably forming secondarily by deuteric or hydrothermal alteration of primary ferromagnesian minerals. Chlorite is found in pegmatites and fessure vein deposits. Chlorites have a silicate layer structure similar to that in micas with compositions near (Mg,Fe,Al)3 (Si,Al)4O10(OH)2 and with brucitelike interlayers with compositions near (Mg,Fe,Al)3(OH)6. The overall composition is then (Mg,Fe,Al)6 (Si,Al)4O10(OH)8. The great many names found in older literature for chlorites with small variations of chemical composition are no longer used. 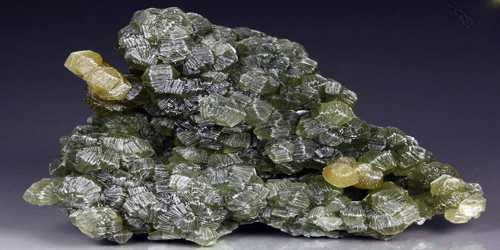 The accepted names are: clinochlore (Mg-rich chlorite), chamosite (Fe-rich), nimite (Ni-rich), and pennantite (Mn-rich). Adjectival modifiers are used to indicate compositional variations. Cookeite is also a member of the chlorite group. The chlorite structure consists of a talc-like 2:1 layer with an octahedral sheet sandwiched between two tetrahedral sheets. The 2:1 layers alternate with brucite-like interlayers. The talc-like layer has a chemical formula (Mg,Fe)3Al1+xSi3-xO10(OH)2 with a net charge of -(1+x) per formula unit. The brucite-like interlayer has a formula of Mg2-x(Al,Fe,Cr)1+x(OH)6 with a net charge of +(1+x). Although other stacking polytypes are possible, polytype IIb is the most common and exists with monoclinic (C2/m) and triclinic modifications (C). The site nomenclature is the same for both modifications. The tetrahedral sheets are each composed of equal numbers of two distinct tetrahedra, T1 and T2. The octahedral sheet in the 2:1 layer comprises two distinct octahedra, M1 and M2, with M1 at the origin, trans-bonded to OH, and M2 in a general position cis-bonded to OH. Similarly, the brucite-like layer comprises two distinct octahedra, M3 and M4, with M3 in a general position and M4 on an inversion, so that there are half as many M4 sites per layer. Chlorite is very common, and is often an uninteresting green mineral coating the surface of more important minerals. However, there are some crystal forms and varieties that are attractive on their own right. Chlorite also forms as inclusions within other minerals, especially Quartz, where it makes the host mineral green and may even cause phantom growths. 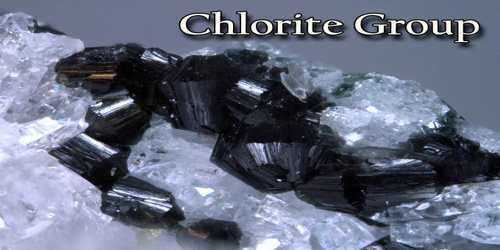 Chlorite occurs naturally in a variety of locations and forms. 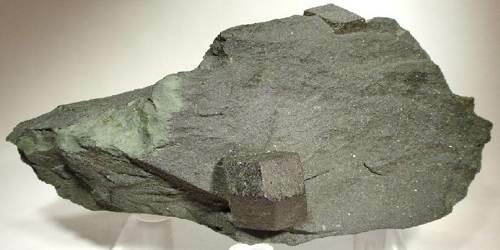 For example, chlorite is found naturally in certain parts of Wales in mineral schists. Chlorite is found in large boulders scattered on the ground surface on Ring Mountain in Marin County, California. It is commonly found in igneous rocks as an alteration product of mafic minerals such as pyroxene, amphibole, and biotite. In this environment chlorite may be a retrograde metamorphic alteration mineral of existing ferromagnesian minerals or it may be present as a metasomatism product via addition of Fe, Mg, or other compounds into the rock mass. Chlorite mineral group are typically green in color, have a foliated appearance, perfect cleavage, and an oily or soapy feel. Their variable chemical composition gives them a range of hardness and specific gravity. This makes them difficult to differentiate in hand specimen.